This Page is for Registered NMT Customers. I have been struggling with this for weeks. In small companies, typically the boss’s contacts are the companies contacts that need to be shared. For some reason this is not simple with Exchange Server anymore. The downside of this method it that the entire mail structure (inbox and all) from the boss’s mailbox will be shared. So that means zero privacy! Ask first. This got the job done, but it needed an update. 1. Create a new Outlook profile (in Control Panel | Mail) with the other user’s (boss’s) mailbox. 2. Open outlook. Right-click the other user’s Contacts folder, choose Properties and verify that on the Outlook Address Book tab the Show this folder as an e-mail Address Book is checked. Under the Name of the address book, change the displayname to something like Joe’s Contacts. 4. In Control Panel | Mail bring up the properties for the new profile you created in Step 1. 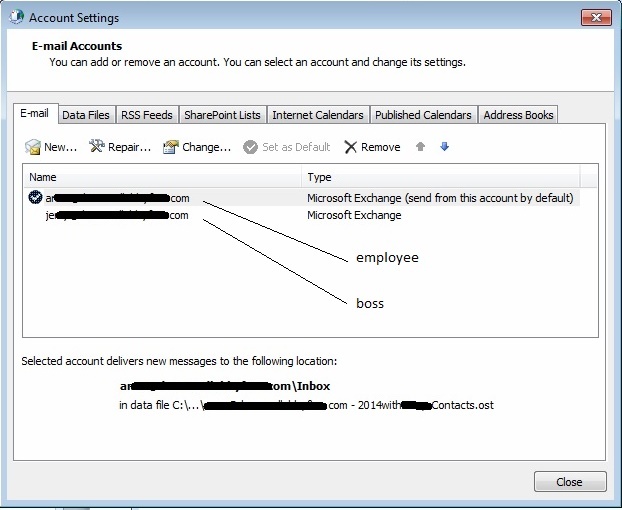 In the E-mail Accounts tab add the Exchange main mailbox (employee’s) and click the up arrow to bring that account to the top of the list and then verify that it is checked as default. 5. Restart Outlook, using the new profile again. 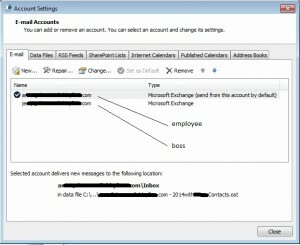 The Exchange profiles in the folder pane in the left of the Outlook window will have the Mailboxes in the wrong order. Simply drag the primary mailbox (employee’s) to the top, above the secondary (boss’s). 6. Be sure to set the new profile to be the default in Control Panel | Mail. I am not sure how I missed it in December. Okay wait, I know it has something to do with the holidays. It’s the same case, but with mild upgrades. It is still a great small server at a great price. Now I do not have to choose between the Remote Access Card and the USB 3.0 card. A great case for Server 2012 Essentials. In fact I have mine all loaded up with an SSD and 2 x 2TB drives mirrored. One correction, I could not get the USB 3.0 card to be stable. I ended up uninstalling it. I found the Windows 8 Start menu (kinda). Comments Off on I found the Windows 8 Start menu (kinda). In trying out Windows 8 preview, I will admit that I have been struggling with the loss of the Start Menu from the last six or so versions of Microsoft Windows®. If you hit the Windows key on the keyboard to bring up the Metro Start screen and then start typing the name of the program you are searching for such as “PDF”, Windows 8 will bring up a list of programs (and Windows apps) with names that start with PDF. I you do not see what you are looking for, then hit the Esc(ape) key to bring up every program installed with folder name grouping similar to the old Windows Start menu.